So I've been seeing lots of arguments to justify photographing of a little girl who subsequently died from injuries in a tornado, and marketing of that photo. Virtually all of them have called attention to other famous shocking images shot by photojournalists and published widely - an RVN army officer executing a Vietcong prisoner, or the firefighter holding a child he'd recovered from the rubble of the OKC bombing [who later died], and so on. In general, photojournalists believe they have an obligation to record the truth of what they see, without regard to how others might feel about their photographs. To me at least, this is especially so when the truth about a situation is not well-known (starving children in some far-off national civil war, for instance), or even being suppressed (as in many goings-on in Vietnam and other wars). Heartbreaking images of victims of some sort of illegal or horrific activity convey the real-world consequences of those poorly-known or nefarious situations. They can galvanize efforts to pull back either the shroud of cover-up or the shroud of ignorance. I get that, and support it wholeheartedly. I think if put in the sort of situation where unreported or unethical activity was going in front of me, I'd attempt to record for all to see what is not known. I wouldn't deliberately seek out such a situation - I leave that for those who have the stomach for it. But where is the widespread ignorance of the fatal consequences often associated with violent tornadoes? What government agency is flooding the media with claims that tornadoes do no harm to anyone? Yes, a photojournalist might be compelled to take such an image and it might be within the boundaries of photojournalism's ethics, but is that image needed to right some wrong, or to reveal something heretofore unknown? What useful purpose was served by publishing that image? A photojournalist made some money. A public medium presented it as "news". Anything else? From a purely technical viewpoint, shooting and marketing the image is likely not illegal in any way. Nevertheless, how does seeing the image make you feel? Did you previously think tornadoes killed people in nice, neat ways? Were you unaware of the threat from tornadoes? Were you misled about tornado hazards by someone or some agency? I'm pretty confident most people don't want to think about what tornadoes do to humans, so perhaps there's at least some reason to reveal the true horror of it. Facing its reality might induce some positive action. But as a viewer of the image, does it make you feel it was the right thing to photograph and publish? I'll leave that to my readers. After the 03 May 1999 tornado in the OKC area, my wife, who worked in the Norman hospital ER that night, told me about the horrible things she had seen coming in to the ER. I had absolutely no wish for her to have recorded images of that agony for me to look at. I'm pretty confident no one in an ER would allow such a thing! After the Jarrell, TX tornado, I was told that the death toll had been difficult to determine after the event, in part because many of the victims had been cut to pieces by the tornado, making it very challenging to know to whom the scattered bodyparts belonged. Again, I have no wish for anyone to share images of those grisly reminders of the violence of tornadoes. It's repugnant for me even to think about seeking out and finding horrific injuries inflicted on tornado victims, to say nothing of photographing them and selling the photographs. I leave the seeking part to the trained and experienced first responders, who surely must go through some awful experiences in dealing with tornado victims on the scene. I salute them for their courage and devotion to help people in awful circumstances. I don't want to be within the damage path after a tornado. If I'm nearby, my policy is to leave search and rescue to the professionals, and stay out of their way. One thing that happens virtually all the time is when bodies are recovered in a fatality situation, they're covered up as soon as possible, until they can be taken to a morgue. Why? Surely it's out of respect for the dead and their families. Would it be respectful to uncover them just so a photojournalist could record that carnage and perhaps win a Pulitzer prize? I definitely think not, and I'm confident most (if not all) first responders would feel the same way. If any photographs were taken before the bodies were covered, it would be for identification purposes, not for a photojournalist to record. In fact, in the case of the little girl in Nebraska, it's my understanding that first responders on the scene did ask the "photojournalist" to stop photographing the victims, but he refused to stop. He's been backpedaling like mad to make himself out to be some sort of saint. This is a troubled young man and his credentials as a photojournalist are pretty thin, it seems to me, although I don't know enough to be sure. I actually find his story to be a pretty sad one, based on what I have heard second-hand, so I don't want to demonize him, despite my concerns over what he did before and after the event. What I find especially disturbing now are the rationalizations I hear about the duties of photojournalists. I ask again: what would you do, given the situation of being there right after the tornado? Would you take the shot? Would you feel right about being paid for its use? In my case, no ... and no. Opinions vary, as usual. No there has to be a line of decency and respect...as a chaser. I do agree that line was crossed in a bad way. If you are in place to help, put down the camera. Then stop intruding into people's worst tragedy when they are most vulnerable and emotional. It is something they do want to forget, not remember. I absolutely agree with what you've discussed. In fact the sort of "photojournalist ethics" as you described are a permanent exhibit in Washington DC in the Newsuem. That exhibit is called the The Bancroft Family Ethics Center. They put you in different situations and ask, do you take the photo or do something about it. They then show a poll of journalist's answers and the public's anwsers. In most cases, the "journalist" takes the photo whereas the public does something to help. In my case I agree I would not have taken the photo, but I can understand the mindset of someone who would. Thanks for your insight as always. I've been fortunate enough to not encounter serious damage chasing in the plains, but I always figured I would put down the camera and stop and help in whatever way I could. I did struggle with this here in NYC after Hurricane Sandy. I shot during and immediately after the storm, but after that I just put the camera down--it just seemed that I was infringing on people's private misery. 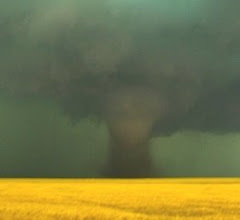 "In the span of a single day, the town of Silverton is ravaged by an unprecedented onslaught of tornadoes. The entire town is at the mercy of the erratic and deadly cyclones, even as storm trackers predict the worst is yet to come. Most people seek shelter, while others run towards the vortex, testing how far a storm chaser will go for that once-in-a-lifetime shot. " John H. - I don't see much of a connection between that forthcoming atrocity of a movie and the content of this thread. "John H. - I don't see much of a connection between that forthcoming atrocity of a movie and the content of this thread." Yeah, sorry--something happened in the blogger commenting system where I intended to comment on one post and ended up on another.